We need a new bar for climate leadership from our elected officials - Oil Change U.S.
Just this past week, the UN’s Intergovernmental Panel on Climate Change (IPCC) — the biggest, broadest, most-respected group of climate scientists on the planet — issued its most dire report yet, outlining the costs of our climate inaction and setting a clear bar for what true climate action needs to look like. What the IPCC laid out was, despite the scientific complexities, quite simple: We need to do more than we’ve ever done, faster than we’ve ever done it. That report also reminded us of what we already know: Every single piece of new fossil fuel infrastructure or fossil fuel development is pointing us precisely in the wrong direction. As supercharged hurricanes bear down on our coasts, wildfires ravage our communities, and the fossil fuel industry continues taking their profits to the bank, it’s up to our elected officials to raise their game, and it’s up to us to make them to do so. Invest in a just transition. No longer is a general concern about a far-off problem going to cut it. No longer will we say thanks for mentioning the words “climate change” in your stump speech, or cheer when you support necessary but insufficient measures while shying away from actually taking on the industry causing this crisis. There’s simply no time for more meaningless platitudes. There’s no time to play nice with the fossil fuel industry, to give lip service to renewable energy without doing more. We need bold, visionary, brave climate leadership, and we need it now. 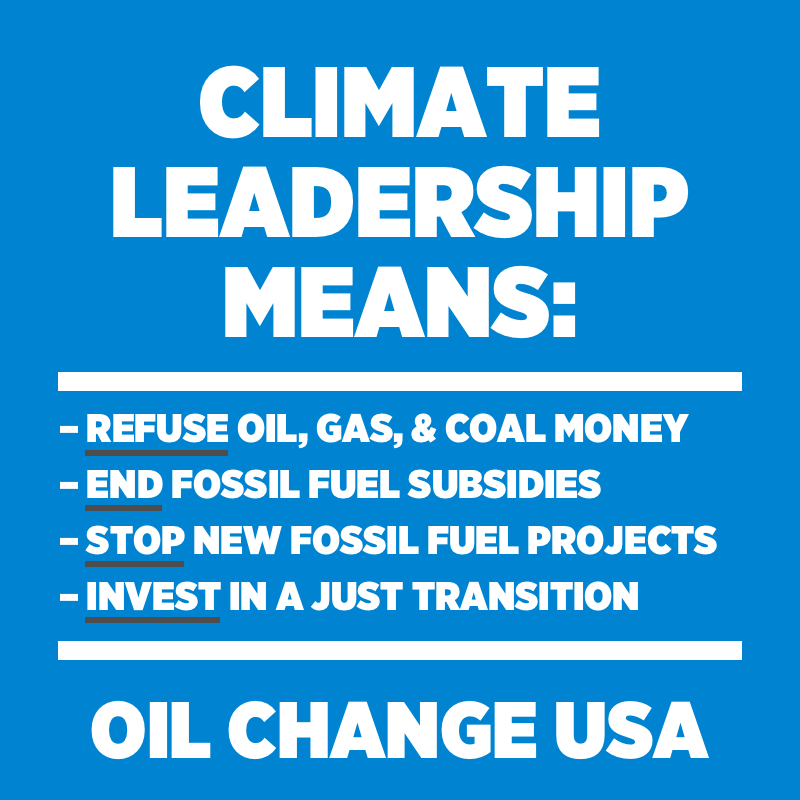 Thankfully, there are a rapidly growing number of candidates who exemplify the kind of leadership our climate crisis demands, and we’ve just endorsed a group of them. We’ll be talking to voters about why these leaders need to be supported, in order to show candidates that if they promise to stand up to the industry and for our communities, we’ll have their backs. And if they don’t do what’s needed, we’ll find someone who will. Learn more about the candidates we’re supporting on our Endorsements page. Share the graphic below…And better yet, get out there and help them get elected.